For all my love of fine dining, I can never resist the lure of a good burger. It’s a simply satisfying meal. 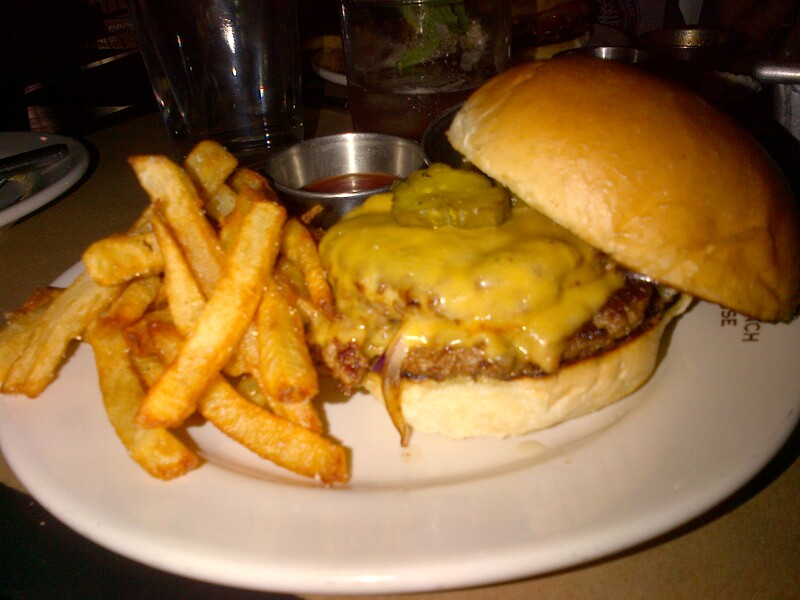 So when I heard that Holeman & Finch was the place for a great burger in Atlanta, I had to drag my brother there. Why did I have to drag him? Well, this restaurant serves only 24 burgers a night. Yes – at night only! Online it states that burgers are served at 9pm, but we called ahead to verify. On that Monday , they said they were serving at 10pm. In preparation for the evening, we arrived at 8:30. We instructed to go directly to the bar and place our order for your burgers and leave our credit card information. The bar area was busy and there were no seats. We left our name for a table in the &dining area and perused their drink list. The list has a great selection of handmade mixes put together by experienced bartenders who are knowledgeable and fun. My choice was a “Veiled Insult”. 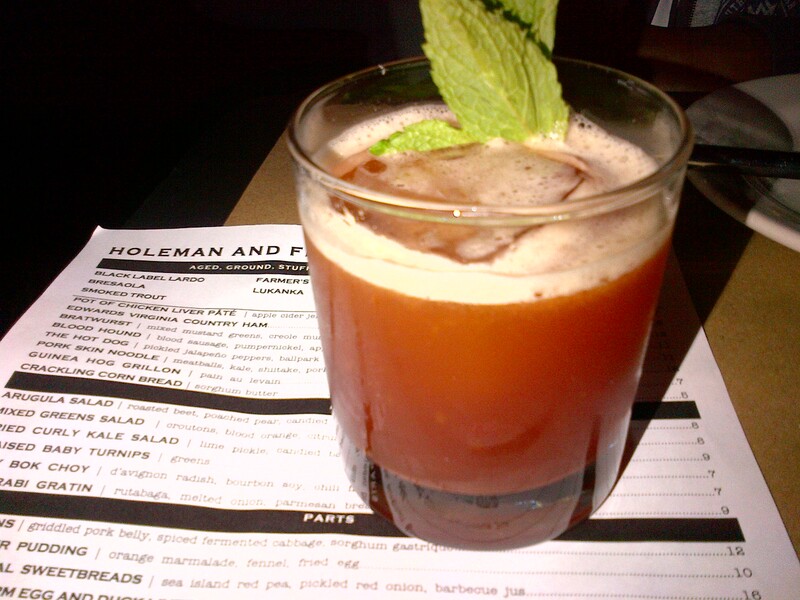 The drink is mix of benedictine, tart cherry, fernet branca, lemon, orange angosturan bitter – shaken and strained over a large cube. You would think it was more bitter but it was actually a bit addictive. I thought it was quite the tasty drink and worth having a second. After being seated in the dining room, we had a hour to kill before the burgers. Looking around the room, it too was full but H & F is not very big with 2 booths and maybe 10 tables in the dining area. It had a great energy about the place and felt cozy. It’s definitely a place that has the potential to be my local (regular go to place) if I lived in the neighbourhood. As we were looking at the menu, we noticed the burger is not listed. I guess you just have to be in the know. 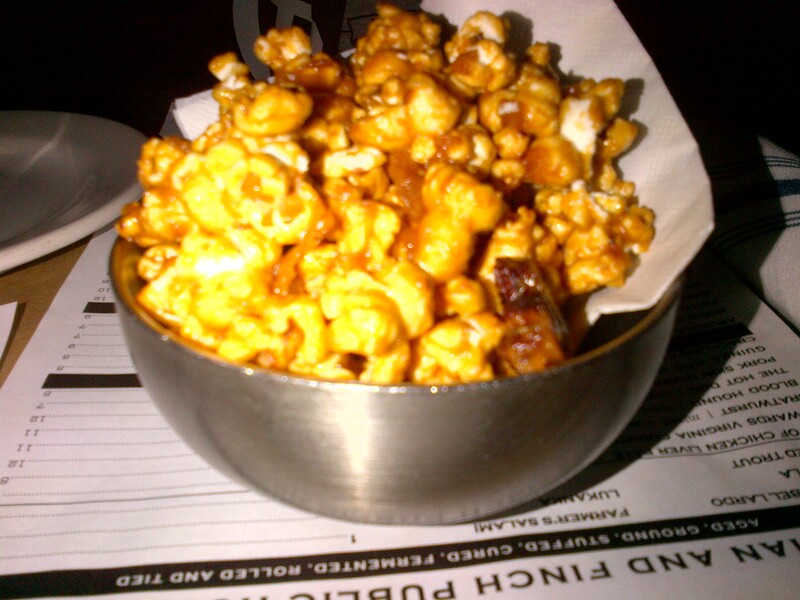 We decided to try the deviled eggs and the bacon caramel popcorn. 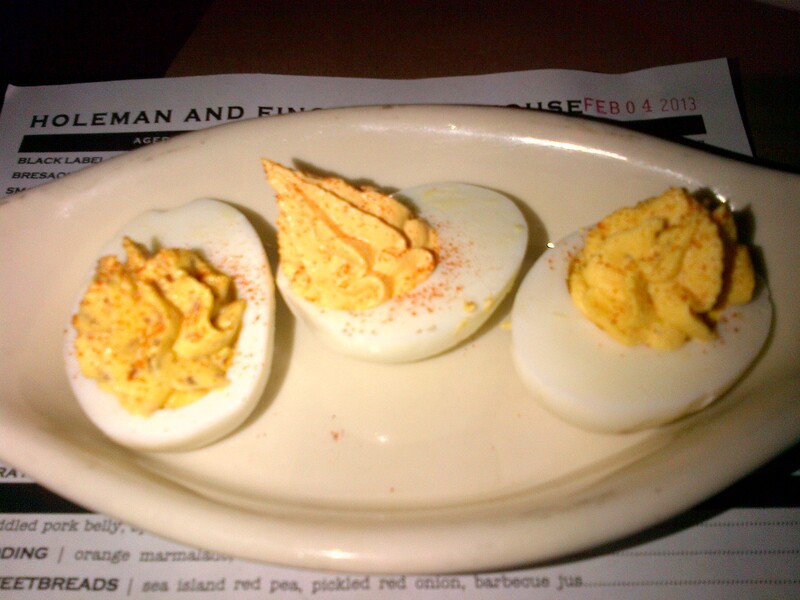 These were okay but I’m not a lover deviled eggs. 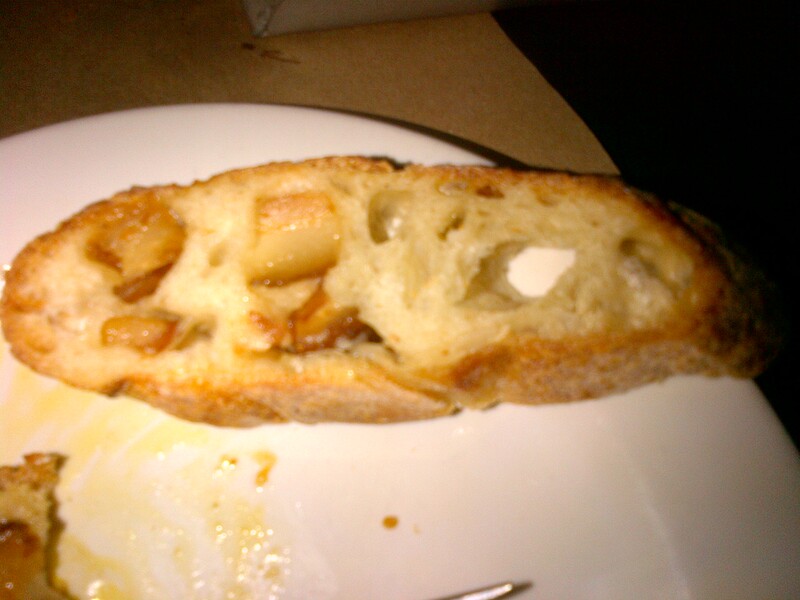 They make their own bread stuffed with bacon!! How great is that and where can I start ordering some loaves? It’s now 10 pm and we here an announcement from the bar area that it’s burger time!! I could smell the meat and started salivating in anticipation. The server told us that the burgers are a handmade mix of grass fed brisket and ground chuck. They bake their own buns and serve house made ketchup and mustard. The story behind the burger has to do with the fact they only served it for those in the restaurant industry after they all got off of work. It just evolved into this “event” and they have no plans of making it a regular thing on the menu. On the weekends, they will serve it for brunch if you can stand the long wait as they don’t take reservations. The burgers are now being served but I notice they keep passing our table. As my quiet outrage starts to bubble, the server comes by to say there are two servings of 12 burgers. We are on the second wave so at 10:25 pm they finally arrive. My first bite – juicy and flavourful. My second bite…mmmmmmm, that hits the right spot. Yes, I did eat the cheese just to experience it exactly how its made. I really liked this burger. it’s served simply with cheese, pickles, ketchup, mustard with fries on the side and its very good. Pingback: Holeman & Finch Public House, Atlanta GA – Marie, Let's Eat!